Use a globe to explain the global circulation of the atmosphere integrating the uneven heating of Earth�s surface and Earth�s rotation. Sketch and label a diagram of the layers of the atmosphere indicating distance above Earth�s surface, temperature changes and other significant characteristics for each layer. Use a one gallon container of water as a scale model to explain what percentage of water on Earth occurs as oceans, glaciers, freshwater and groundwater. Compare heat transfer in the atmosphere and the oceans. 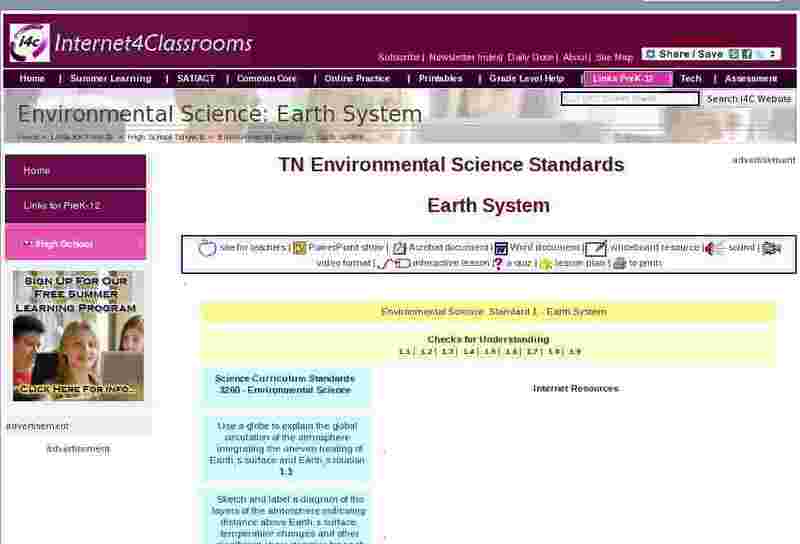 Describe how gases in the atmosphere affect climate. Differentiate between divergent, convergent and transform plate boundaries. Create a concept map depicting the rock cycle. Relate erosion (weathering and transportation) to soil formation. Differentiate between the hydrosphere, lithosphere and atmosphere.